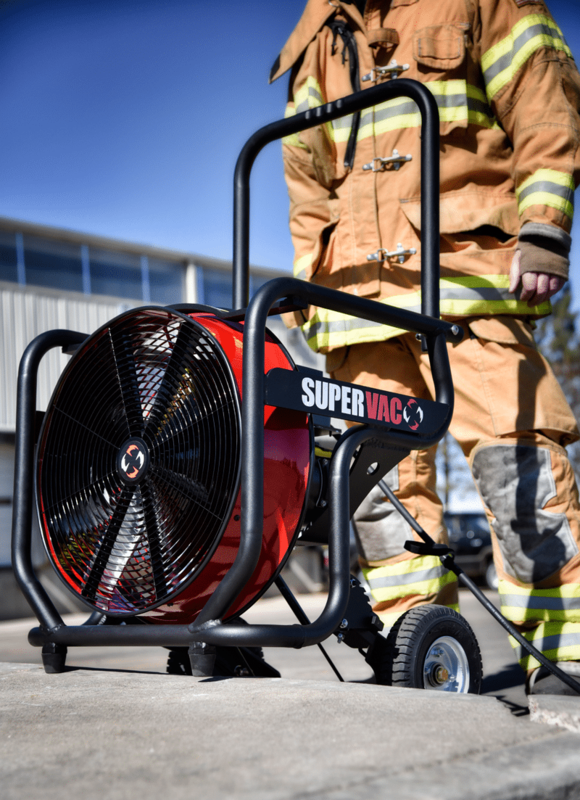 The Valor Series is the latest in PPV innovations from Super Vac. Featuring a Patent Pending frame design that is simple and intuitive to position on the fire ground, the Valor series is engineered to ease the toughest ventilation challenges. They feature a tough, tubular aluminum frame (15% lighter than previous models), full width handle, real rubber never-flat tires, 5-position tilt via the quick step pad, and the ability to easily attached ducting to the output. The Valor was also designed to be more versatile. With the addition of the 5-Position Step Pad, this PPV easily can be placed on stairs eliminating problems previously encounters on 1 and 2 step entry ways and front porches. The Valor also keeps firefighter safety in mind. Not only are the heavy duty tires tough enough to maneuver curbs and debris, found on scene, they are also strategically placed on the back of the frame so you never need to put yourself between the PPV and the fire during set-up.